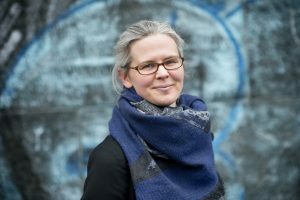 Ellen Rutten is Professor of Literature, with a focus on Slavonic literature and culture, at the University of Amsterdam. Her latest book, Sincerity after Communism: A Cultural History, was published by Yale University Press earlier this year. In my new research project Sublime Imperfections, I examine discussions in which the imperfect or the non-polished is framed as something positive — as a guarantee for authenticity or humanness in a digitized age, for instance. Together with two PhD students, I examine how the logic and aesthetics of imperfection function across different world regions. We look at and compare discussions about such diverse objects and spaces as torn jeans, glitch music, repurposed post-industrial sites, and purportedly blurry photographs or films in art, cinema, and advertizing. With my background as Russianist, and as someone born and raised in the Netherlands, I pay special attention to the positive feelings that are projected onto the non-polished and non-perfected in the Netherlands and in Russia, in print, online, and social media. In (both Russophone and Anglophone) public discourse about Russia, for instance, you see that speakers frame the country as a place that owes its beauty and authenticity to being imperfect, flawed, or chaotic. In our project, we monitor this type of discourse – and we also critically interrogate this stereotype: after all, the habit of reducing Russia to a faulty-but-wonderful space is often a downright orientalist, damaging habit. How do you see the current state of freedom of speech in Russia? Of course, in Putinist Russia, after a period of complete freedom just after the downfall of the Soviet Union, we once again witness serious local problems with freedom of speech. I always make sure that I explain to my students that this does not mean that we are ‘returning to the Soviet Union,’ as some journalists argue. The take of the current authorities on freedom of speech differs fundamentally from that of the Soviet era – when the authorities wanted citizens to comply with state views in public, but also in private spaces (and not just in their kitchens, but in their ‘hearts and minds,’ too). The situation is quite different today. Putin and the Putinist elite do not care that a small group of intellectuals criticizes and mocks them in private: they just do not tolerate mockery and critique via mainstream or lushly visited media. That difference with the Soviet situation is often overlooked in western media, but you need to acknowledge it if you want to understand how media work in present-day Russia. By pointing to the difference between Putin-era and Soviet-era censorship, I am not trying to say that the current media modelling is no reason for grave concern, by the way. It is – and I agree with scholars who frame the Putinist approach to media as semi-authoritarian. The past year or two, I even find myself wondering sometimes whether ‘semi-‘ is still an appropriate prefix for the contemporary Russian media model. Can we also observe positive or exciting developments? Could you mention concrete examples? What interests and inspires me, is the smart ways in which many higher-educated young Russians in journalism and the arts operate within the current mediascape. Both online and in Saint Petersburg and Moscow, in the past years I witnessed multiple new initiatives which, without being anti-Kremlin or overtly politically motivated, clearly boast a subtle and critical tone and take on life in Russia. These initiatives are not activist enough to clash with the authorities, but progressive and professional enough to offer helpful alternatives to mainstream work and entertainment domains. Existing and new (online) publication platforms like the New Literary Observer, Colta, and InRussia are good examples. I am also thinking of the exciting academic and public events hosted by my colleagues at Smolny College and the Higher School of Economics — and I spotted the same Kremlin-ignoring-and-progressive/energetic working mode at a lecture series by art and culture professionals at Moscow’s Museum Night this year. How do you see the future of media freedom and freedom of speech in Russia? Hard to say without a crystal ball. In any case the types of initiatives that I just mentioned will, I think, play a vital role in that future. This entry was posted in Yleinen on 4.7.2017 by Marielle Wijermars.